I love this top and the colors are perfect. Coral is the color that is out there now. Great spring and summer look. Rich vibrant colors. Runs big so believe you can downsize if needed. 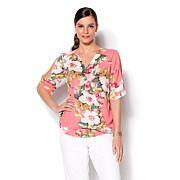 Its looks great with any jean or beach wear. Thanks Iman! The top fit perfectly. 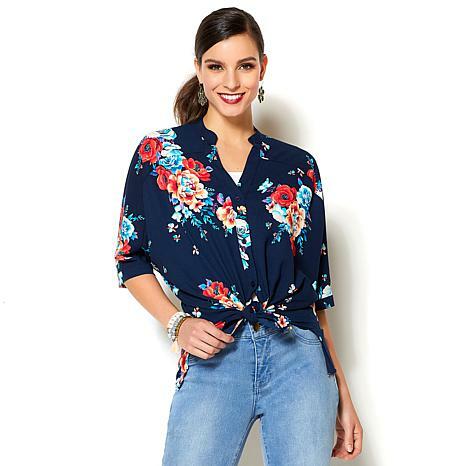 The colors are great and Ive received many compliments. 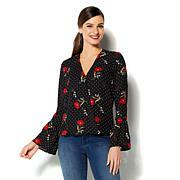 I love everything about this blouse. Bought each color and two more in blue so I will have one for years to come. It work open, tied at the waist, or tucked in and attracts more compliments than any blouse I've ever worn. Love it. I can wear multiple ways. It don't hug or stick to me and looks so taylored. I would love to see this in solids and maybe other prints like leopard. This is the perfect anything you need shirt. Interesting necklines are all the rage. We love the way this one does something a little different. 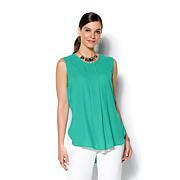 Crafted from soft, viscose knit, this top is lightweight and drapey and can be tucked in without bulk. Elastic cuffs let you blouse the sleeves, if desired.